UPDATE: According to Nuckles87, patch only affect first two boost missions. Costing you 8 stars at the most, so not as bad as previously thought. New Wii U owners may not want to update too fast. 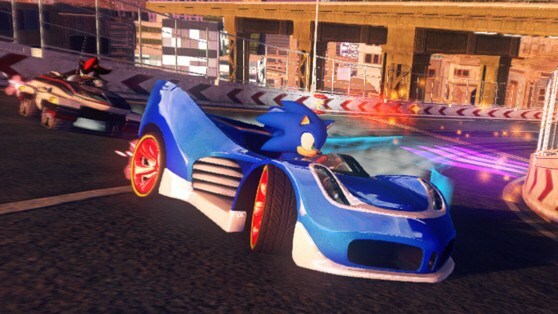 It seems Sega’s first patch for Sonic and All Stars Racing Transformed has a glitch in it that stops some boost challenges from having checkpoints. Leaving you with no other choice but to fail the mission which leaves you stuck. However, there are some ways around it. Play while it’s updating and finish the challenge. There’s no guarantee that there won’t be another glitched challenge, but it will get you past that. Editor Nuckles87 has discovered that if you fail the mission four times on easy, it will let you pass to the next challenge. If you just got your brand new Wii U. I’d recommend holding off on doing the system update until this game breaking issue gets a new patch of it’s own. Hopefully Steve or SUMO fixes this quickly, as I plan to get this version tomorrow. :/ I know the patch may take a little time, but I hope they are working on it! Oh well. Still such an awesome game. Hope Sumo fixes this quickly. I hope all this stuff with the Wii U and Sonic & All-Stars Racing Transformed is sorted before the console and this version of this game is released over here in Europe. To be honest all of this seems a bit rushed, unfortunately. Chill out guys, it’s just a bug. It’s not the end of the world, and even if they don’t fix it, it’s the first two missions. Not a big deal. I mean, comments like, OH MY GOODNESS ITS A GOOD THING I GOT THIS FOR A DIFFERENT SYSTEM!! Don’t even make sense. It’s not that bad…. but its a bug that keeps you from progressing the game though, that’s why everyone is saying that you can’t get through boosting missions without boost pads. Vote for Bayonetta to be a DLC character in Sonic & All-Stars Racing Transformed !!!! iv found several glitches and bugs in the xbox360 version of the game that i assume afew other people have seen or found them too… no way to tell sumo or sega though. – train glitched in the returning jet set radio level (its missing a middle carrage). – rank bug (iv come split seconds ahead of another racer and it clames me to be 4th place, but in the rank im 3rd). – in some levels iv been pushed (by the hotrod) through the level geomitry and stage. LOL! Nuckles87 thought my original headline sounded like sensationalitic journalism and I agreed that it was a bit harsh since there’s ways around the problem, so I toned it down a bit. It’s probably a coincidence. Usually when you play video games for long time, the systems fans over heat(or some thing like) making the game freeze and unplugging/turning off the manes and repligging/turning them on again then makes it work again. So it’s nothing really that bigger deal. My game froze on Galactic Parade, and I was playing as Sonic. I too had to unplug my Wii U. Playing as Shadow & Wreck it Ralph, Galactic Parade locks up any time that two live players hit the room with all of the floor lights. Every time. Must unplug the machine to reset. Pretty big glitch.